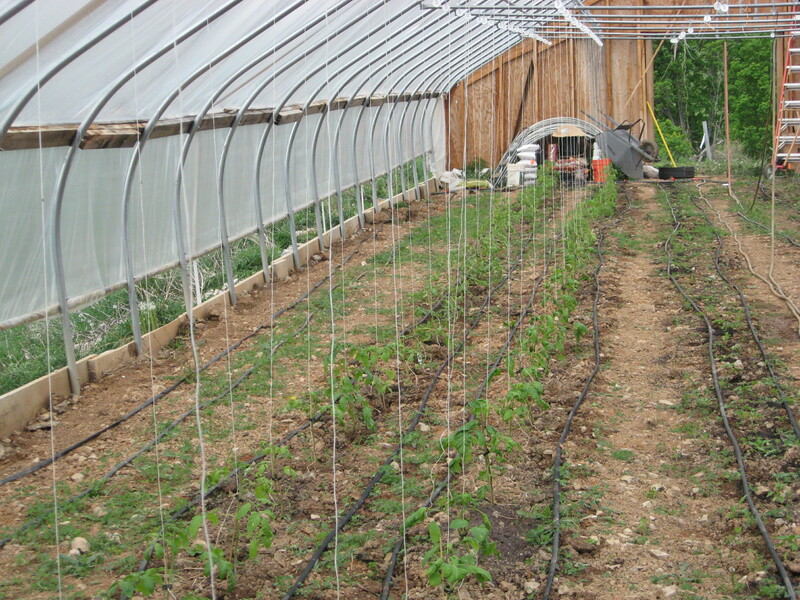 I was able to set 96 tomato plants in the high tunnel this week. I purchased some Tuscarora Farms organic plants through Maple Avenue Market and got them planted in four rows. The plants were large enough to get them clipped to their support string. I have been having a hard time judging how much water I should be dripping through the irrigation lines. I have dialed back how long the water stays on and hopefully I will keep from flooding the new plants. In the tunnel, the temps rise to about 85 during the day, with the doors open and sides rolled up foot or so. I hope to keep the temps below 90 this year in an effort to provide a better growing climate. 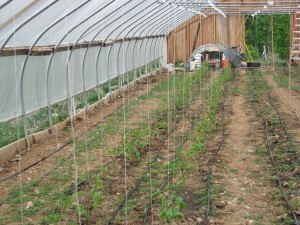 Last year I let the tunnel get too hot and the watering was uneven and done by overhead sprinkler. The varieties are Brandywine, Big Boy, Moscow heirloom, Green Zebra, Purple, cherry and grape. I may add a few more to fill in the rows.